1980 was the year for remaking films as television series, it seems. Yesterdays post featured a show taken from the 1973 film Westworld and this series, of course, comes from the 1953 classic film of the same name. It follows up on a 1979 three part miniseries that retold the story of the film. The series found the characters dealing with life in Hawaii after the Pearl Harbor attack that brought America into WWII. The cast also included Roy Thinnes and William Devane. This series lasted only 13 episodes and has never made it to DVD. There are a few clips on YouTube, but not much more. Above is a commercial for the show from a St. Louis affiliate uploaded by ziggyelman. Westworld (1973) is one of those films I just can't watch. It's extremely creepy and unsettling. It spawned a sequal (Futureworld ) and this television series in 1980. The premise is Simon Quaid (James Wainwright), the scientist who created the robots that ran amok in the previous two films is plotting to take over the world by planting his robots in key positions throughout the planet. John Moore (Jim McMullan), the chief of security for Delos, the firm that created the parks and employed Quaid, is charged with finding the androids and foiling Quaid's evil plot. He's assisted in this quest by Pamela Williams (Sellecca). This series flashed by very quickly. 5 episodes were produced, but only 3 aired. It's never made it to DVD, and clips, but not full episodes are available on YouTube. Above is a clip from the first episode, which finds the team on a nuclear sub trying to find Quaid's robot among the crew. It was uploaded to YouTube by StatesEdgeFilms. The 1978 TV Miniseries To Kill a Cop was the inspiration for this cop series which lasted only one season. Joe Don Baker played the title character - an intelligent, compassionate chief of detectives who's southern drawl made him seem out of place in Manhattan. Like Telly Savalas' Kojak and his lollypop, Eischied had a quirk. He kept a cat as a pet and was devoted to it. The story lines were typical of the genre and era and each week he would help his detectives solve the case. This series was the first to pay its lead actor $1,000,000.00 for his role, and only lasted 13 episodes. It's never made it to DVD and is extremely difficult to find online video of. Above is the only clip I could find, included in a series of show opens from 1980. It was uploaded by bobtwcatlanta. "Well, well, if it isn't the B.A.D. Cats." This deathless prose, uttered by Jimmie Walker in the short lived action series of the same name is about as good as it gets. This show is like a parody of cop series television of the era. The premise is that the LAPD has hired two former race car drivers to make up a highly specialized unit called the Burglary Auto Detail Commercial Auto Thefts, or B.A.D. Cats. Officer Donovan (Asher Brauner) and Officer James (Steve Hanks) drive around LA, getting into car chases and apprehending criminals like car thief Walker. They occasionally enlist the help of Officer Jensen (Pheiffer in one of her first featured roles) when they need some jiggle action. This Aaron Spelling show lasted all of 6 episodes in January and February of 1980. While researching it I ran across a review on IMDB that had an anecdote from a real LAPD officer that worked security on the set about how the actors went rogue during lunch one day and started driving around pulling over civilians just for fun. Everything about this show from the ridiculous title to the campy cast just screams parody. Needless to say, you can't find this on DVD. Above is one of the chase scenes from the series featuring the detectives and Jimmie Walker. It was uploaded to YouTube by Persucecionolvidada. This spin-off of Cheers (1982) featured Carla's (Rhea Pearlman) ex-husband Nick (Hedaya) and his new blonde bombshell wife Loretta (Kasem) and the ins and outs of their marriage. The series begins with Loretta leaving Nick and moving to Las Vegas. He follows her in hopes of reconciling and is subsequently followed by his (and Carla's) son and daughter-in-law. They all live with Loretta's sister Charlotte and her husband Mark. The conflict sprung from the culture class between the Tortellis and the Watkins and Nick's selfish, cheating ways. The series never had high ratings and lasted a season. After it was cancelled, Nick and Loretta resumed making occasional appearances on Cheers. The show has never made it to DVD, but you can find several episodes on YouTube. Above is part one of the pilot, uploaded by 56thAlbanyProd. Coming off the phenomenal success of The Karate Kid (1986), Pat Morita sold this series he helped develop about an unusual police lieutenant who used eastern spiritual methods to solve crimes in Los Angeles. His inscrutable manner and non-violent techniques made for interesting stories and low ratings, though the series did hang on for two seasons, with multiple changes in format. Also featured in the show were Katherine Keener, Madge Sinclair and Robert Clohessy. This series has never been released on DVD and full episodes are difficult to find. Above is an episode teaser and show open from later in the run uploaded by WREYtube. This one has a holiday theme. I thought it was appropriate, considering we're kicking off the holiday season! In today's culture, Thanksgiving is about two things - giving thanks and eating. This special is mainly concerned with the latter. Garfield goes through several traumas in this special, including the vet and an owner who can't cook. Listen for character actress Pat Caroll as Grandma. This special is known to Garfield fans and people who were kids in the late 80's. It's available on DVD and can be seen in full on YouTube, thanks to an upload by GarfieldSpecials2011. Part one is above. So often TV movies are wonderful trash - fun to watch, but campy and without depth. This film is the rare exception. Melodye Amerson (Darby) leaves a complicated life in the city behind to live among an isolated group of people in a rural valley as their school teacher. Upon arrival she finds the children hard to reach and the townspeople closed and uncommunicative. As she tries to make progress with the kids she begins to discover a remarkable truth about the community that sets them apart. Instead of giving in to their fear of her knowledge of their secret, the people find the courage to accept her and grow into their gifts. This lovely film, produced by Francis Ford Coppola and based on a series of books by Zenna Henderson, has warmth and a gentleness that is uncommon in popular entertainment. Look for a restrained, likable William Shatner as a country doctor. It's available on DVD, though the transfer is very poor quality, according to most of the reviews. It's also above, available in full on YouTube, uploaded by TVTERRORLAND. 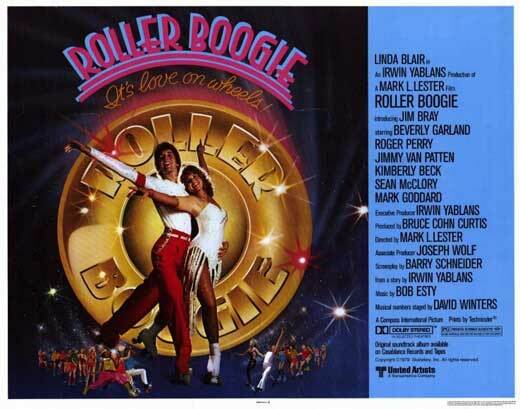 Before there was Xanadu (1980), before there was Dirty Dancing (1987), there was Roller Boogie. Terry Barkley (Blair) is dissatisfied with her home life in Beverly Hills. She spends most of her time on the boardwalk in Venice Beach skating. Her parents and friends don't understand this obsession, which leads to friction at home. While down there she meets Bobby James (Jim Bray), skater extrodinaire, and boy from the wrong side of the tracks, and they start to form a friendship. When the friction at home becomes unbearable, she gets in her Excalibur and runs away. Of course she heads to the beach and parks outside Bobby's apartment. The next morning she engages him to teach her to dance on skates in hopes of winning the big boogie contest at Jammers skating rink. Unbeknownst to the skating community, Jammers is about to be forcibly closed down by a group of mobsters who are developing the area. When Terry and Bobby overhear the plot they set about trying to do something about it. This fluffy film is certainly not in the league of Dirty Dancing, or perhaps, even Xanadu, but both those films feature story lines or plot points that appear here first - rich girl meets boy from the wrong side of the tracks who teaches her to dance, and roller skating boy saves landmark and old-timer from decay and death. The film is pure cheese, and is clearly designed to make a fast buck, but it has some interesting links to the future. Dov Charney's American Apparel became obsessed with the film recently and played it in their stores. It's easy to see why. The film looks like the store was the main source for the costumes - short shorts (on both girls and boys), leotards, metallic duffels, tights and skin tight tees abound. Look for Beverly Garland as Terry's mom. This film has developed something of a cult following and can be found on DVD. The trailer for it is above, uploaded to YouTube by deadenddrivein. Gerald Cross is the very epitome of the CIA. He's tough, shrewd and dangerous. He's also marked for elimination. 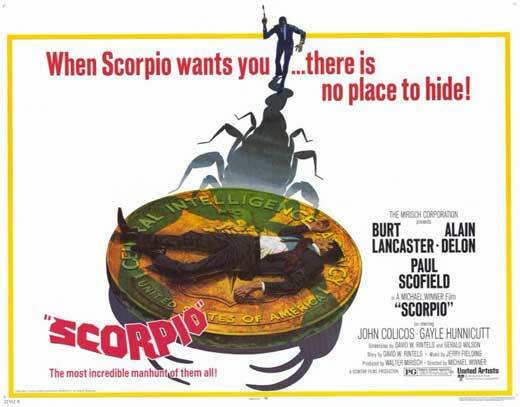 Jean Laurier - aka Scorpio - is Cross' friend and associate. Cross has trained him to be as ruthless and efficient as he is. Scorpio's next assignment is to eliminate Cross. It's not going to be easy, and both men know it. Cross is on the run and will be difficult to find. When they finally meet it will be a battle to the death. Who will prevail? This classy spy thriller benefits greatly from two wonderful performances by the leads. Delon is subtle and he's developed a multi-dimensional character that holds your interest. Lancaster is a master at this kind of role. He's oblique, but fascinating and, as was his habit, did all his own stunts at age 59. The film is very taut, and has some really compelling moments. Listen for a masterful score by Jerry Fielding and look for a scene where Lancaster disguises himself in blackface. This film is available on DVD. It's not as well known as other spy thrillers of the era, but is definitely worth seeing. Above is the trailer, uploaded to YouTube by Annie7676. This charming and gentle, if strange film was Charlie Chaplin's last directorial effort. Natascha (Loren) is exiled Russian royalty - a countess - working as a dance hall girl in Hong Kong. She's part of an underclass of people such as herself who have no identity papers and therefore cannot leave. They have no prospects and very little future. Enter Ogden Mears (Brando), heir to a petroleum fortune. He's just been appointed ambassador to Saudi Arabia and has arrived in Hong Kong on business. He's traveling by ocean liner and is met by a friend of the family who bring with him three of the royal underclass, including Natascha. After a drunken night on the town Ogden and his entourage depart for home, only to discover that Natascha has stowed away in Ogden's closet. She appeals to his better instincts, but when that doesn't work, she blackmails him let her stay. Of course, the close quarters of a stateroom lead to love, and complications. Will Ogden throw away his career for Natascha? There's a strange quality to this film. It's shot through with Chaplin's charm and sophisticated physical comedy, most deftly performed by Sidney Cargill as a dotty butler, but Brando as Mears strikes an odd note. His comedic style is a bit heavy handed, in a part more suited to Cary Grant (who had retired from films a year earlier, and also had a stormy relationship with Loren). Not only did Chaplin direct, he also scored the entire film and cast his son, Sidney Chaplin, as Mear's associate. Look for Tippi Hedren as Ogden's wife and Margaret Rutherford in a cameo as a passenger. This film is available on DVD and can be seen in full on YouTube. Part one is above, uploaded by Longoaiphong. This little promotional film comes from a time when the oil and gas industry wasn't on one side of a huge political divide. The chasm that has opened up in this country wasn't even a crack in 1956 when this was produced. On Mars, an unpleasant dictatorship is the form of government, and the problems facing the Martian populace include no reliable fuel for powering their civilization and no lubricants for their machinery. What's a dictator to do, but send a fearless adventurer over to the next planet to borrow a cup of information. Down comes Colonel Cosmic to investigate. He lands in the USA, where he learns that the society runs on something called oil, and that the people of the land would be in a sorry state if they didn't have this miracle substance. He also learns that the idea of capitalism - the free market and a government that doesn't meddle in it with a lot of silly regulations - is another important ingredient in the success of this strange land. He returns with this important information and transforms the Martian economy in one day as the inhabitants go about prospecting for oil and setting up businesses. This strange piece of mid-century propaganda is in the public domain and is consequently readily available in a number of places. It can be seen above, thanks to an upload to YouTube by shaggylocks. Before he was The Scarecrow in Scarecrow and Mrs. King (1983) Bruce Boxleitner played real life game hunter Frank Buck in this adventure series designed to capitalize on the success of Radars of the Lost Ark. Buck was a sensation in the early 20th century as a big game trapper and conservationist who wrote the book this series, and a film in 1932 was named after. Set in 1930's Malaya, the real-life history of Buck has been embellished to make him a matinee idol who defeats bad guys in each hour long episode. The series has never made it to DVD. You can find full episodes on YouTube, however. Above is the second episode to air - The Seven Keys to Singapore, uploaded by MrDougwarner69. This week I'm reminded that Steve Guttenberg was in some strange shows. The other day I posted his 1979 sitcom Billy, which found him exploring his fantasies in a decidedly Walter Mitty fashion. This series from 3 years later, which also featured funny lady Edie McClurg and Laugh In veteren Gary Owens, found him running a seedy Atlantic City hotel. The plot of the series was continually being interrupted with sketch comedy of a Monty Python style in the most creative ways. The sketches were interwoven with the action at the hotel, but were completely unrelated to it. The series was a summer replacement and there were only 5 episodes made. Below is one of the sketches from the show, uploaded to YouTube by SufferingFoolsMusic. This series is fondly remembered by the few who saw it in first run. It was subsequently aired in Britain, where it was better received. It's never rated a DVD release. You can, however, find many of the sketches on YouTube. The post war housing boom lead to a suburbia populated with ranch houses which were first thought of as unbearably cookie cutter, inspiring the song Little Boxes. They have since become popular again with people who have a yen for mid-century design. With so many new homes on the market, the developers had to be smart about selling them. Frequently they produced films like these to entice buyers. This film was made with women in mind - wives in particular. Jane and her friend Alice (Hunt) conspire to convince Jane's husband George (McGavin) to pony up for a new kitchen by leaving him alone in the old one for a weekend. This can be seen on YouTube, thanks to an upload by shaggylocks. It's in the public domain so it's fairly easy to locate online. It's almost completely unknown, however. This series, which has a close cousin in The Secret Life of Walter Mitty (1947), Billy Fisher works as a mortician's assistant but dreams of glory. He's so immersed in his fantasy world that his family rationalizes his odd behavior as best they can. He has a staunch supporter in his mother (Peggy Pope), though. Viewers were treated to big budget enactments of his imaginings, including jousting, parades and celebrity guests. The series didn't run for long. It was cancelled after the 7th episode. There is no DVD collection available commercially and episodes can be hard to come by. Above is a compilation of show opens from '79 and this one is included in it (as is Vega$ - yesterday's feature on the blog). This Aaron Spelling drama series never reached the heights of Charlie's Angels (1976) or The Love Boat (1977), but it had it's admirers. Robert Urich plays detective Dan Tanna, a tough, determined gumshoe with a heart as soft as a pillow. He wheeled around the gambling city in a '57 T-bird and protected his clients from the more mercenary elements in town. Look for Greg Morris of Mission Impossible (1966) as the cop with a chip on his shoulder. This series has made its way to DVD, and can be found pretty easily. Above is a network promo for the show, uploaded to YouTube by robatsea2009. The disco craze of the late 1970's was the subject for this sit-com. Set in Passaic, New Jersey, it told the story of Billy Manucci (Naughton), a disco dancing, ice cream parlor jockey who wanted to be Tony Manero (of Saturday Night Fever ). Billy lives with his Italian American family and spends all his nights at the local disco, Inferno. This series lasted only 9 episodes. The opening credits are above, uploaded by robatsea2009. Though the show wasn't a hit, the theme song was, and went on to reach number 5 on the pop charts. It's below, uploaded by videokeking2009. Inspired by the Mrs. Columbo (1979) post the other day, Leighton did a little research into spin-offs and found this ultra-rare special. It was created by and featured Lorenzo Music in his role as Rhoda's besotted doorman, Carlton, now in a new position as a doorman in a seedy hotel. The show is extremely hard to find. I've only been able to locate one source for it. Toonarific.com has copies available, though the price is quite steep - $100. Above and below are a few screen grabs from it. This extremely rare special, produced by MTM productions has never made it to a commercial DVD release. It's not available for viewing online that I can find. The factor number should really be 11 or 12 for this one. In this, the first starring vehicle for Martin Short, we meet a group of young lawyers just out of law school and starting their careers at the venerable law firm of Bass and Marshall. Among them is Tucker Kerwin (Short), an earnest young man always interested in doing the right thing. He's surrounded by a cast of characters that include do-gooders, sybarites, blue bloods and the beautiful and manipulative Sara James (Shelly Smith). Stealing many scenes is Emerson Marshall (Wilfrid Hyde-White) the senior partner who is going just a bit dotty. From all accounts, this series was just as charming as Taxi (1978), with which it shares creators. Look for Joe Regalbuto of Murphy Brown (1988) fame as a junior partner. This series was cancelled after 9 episodes, though 13 were made. It's not available on DVD and only the opening credits are on YouTube. They're above, uploaded by carpalton. Before she was Janeway on Star Trek: Voyager (1995) Kate Mulgrew played Lt. Columbo's crime solving, reporter wife in this ill conceived NBC series. It lasted for only one season, much to the pleasure of Peter Falk and Columbo creators Richard Levinson and William Link. Mulgrew played Kate Columbo, who used her investigative reporter skills to solve mysteries. Columbo himself never made an appearance in the show, but in the credit sequence below, uploaded by PIMannix you'll see his car and his dog. The series did not do well in the ratings and was heavily tinkered with during its short run. It was retitled twice, first to Kate, The Detective, and finally to Kate Loves a Mystery. The updated credit sequence featured a new theme song and all evidence of Columbo was erased - the character was renamed Kate Callahan. Below is that new credit sequence, uploaded by robatsea2009. Needless to say, this series has never made it to DVD, though one episode of it was included as a bonus feature in the DVD releases of the Columbo series for seasons 3, 4 and 5. I went to a benefit for TRU (Theater Resources Unlimited) this weekend and Melba Moore performed - beautifully, I might add. It brought to mind this show, which had the unfortunate luck to premier on the night of the shuttle disaster. It garnered record settingly low ratings and was pulled off the air immediatly, only to be rebroadcast in August of the same year, also to phenomenally low ratings. Melba played Melba Patterson, a divorced, single mother who ran the Manhattan Visitor's Center in New York where she worked with Jack (Jacobi). She, her mother, Rose (Barbara Meek) and her best friend Susan (Gracie Harrison) cared for her daughter Tracy. There was an Imitation of Life (1959) thing going on, in that Rose had taken care of Susan as a live-in housekeeper when she and Melba were children. There were only six episodes of this show made and they're very hard to find. Only the opening credits are available on YouTube, buried in the same credit collection that I featured yesterday for Foley Square, uploaded by bobtwcatlanta. Before Murphy Brown became a big hit for Diane English she produced this quirky sitcom about an assistant DA in New York City. Alex Harrigan (Colin) is a dedicated professional who has some issues with her love life (sound familiar, Murphy Brown fans?). She works for DA Jessie Steinberg (Elizondo) who is a task master and she's having an on-again, off-again affair with her neighbor, school teacher Peter Newman (Lembeck). The series was short lived (14 episodes) and was paired with another series about a strong female in the work force - Mary, which was written up earlier on the blog. Neither series performed as expected and both were cancelled in their first year. They were programmed against the über popular Touched by an Angel. The series has never made it to DVD and only the opening credits can be found on YouTube, buried in a compilation of opening credits from other shows from the same year. They're above, uploaded by bobtwcatlanta. Kate (Clayburgh) plays it safe - she has all her life. She's a mathematics professor in Chicago, lives with a nice man (Grodin) and doesn't tempt fate. When a job interview and the wedding of her widowed father sends her to New York she finds herself presented with a choice that promises to rock the boat. That choice comes in the form of Ben (Douglas), a former ball player, married and the complete antithesis of everything Kate has tried to do with her life. Will she cut loose and go with her gut just once, and if she does, how will that decision effect her future? This film has some charming performances in it, and displays some sly wit. The title song was a big hit for Diana Ross, reaching number 9 on the charts. Look for Beverly Garland and Dianne Weist in small roles. Though it's never been available on DVD, you can find this title to rent on YouTube. A VHS release was made and tapes can still be found. Above is the television trailer for it, uploaded to YouTube by robatsea2009. Anyone who loves 60's and early 70's bubblegum music should know about the Cattanooga Cats. This series followed the animated antics of the similarly named band as they traveled around singing their upbeat music. The series was made up of segments with the Cats, short musical interludes, something like music videos and segments featuring three other sets of characters - Around the World in 79 Days, It's the Wolf! (featuring Paul Lynde as Mildew) and Motormouse and Autocat. Originally an hour long, Saturday morning show, it was shortened to a half our in its second year and was cancelled in 1971. Casey Kasem, noted radio DJ voiced one of the cats in the speaking portion of the show. He didn't contribute his voice in the songs, however. The Cats have developed something of a cult following, though the actual episodes can be hard to find. Many of the musical interludes can be found on YouTube. Above are the opening credits, uploaded by cartooncoon. The ever lovable Florence Jean "kiss my grits" Castleberry departed Phoenix, Arizona and Mel's Diner in the spring of 1980 and landed in her home town of Fort Worth, or Cowtown, as she called it. There, she bought a run down old road house and proceeded to make a life for herself. That life lasted two seasons and included her mother (Sudie Bond) and her uptight sister (Lucy Lee Flippin) and a whole lotta wacky goings on. This Alice (1976) spinoff had a lot going for it in its first season. It lost it's favorable air time in its second season and plummeted in the ratings. The series has never been released on DVD and can be hard to find. Above is the series debut promo and opening credits, uploaded to YouTube by seanmc31076. Claire McCarron (Colin) has quit her job in the DA's office to open a detective agency. It's rough going, and she's frequently without funds, but somehow it all comes together. Her friend Willie (McDormond), who still works for the DA and her brother Fred (Patrick James Clarke) who is a police lieutenant provide moral support and information when necessary as she navigates the back alleys of New York digging up the truth for her clients. This show was one of those ratings victims. It was programmed poorly, against successful Saturday night show, The Golden Girls and only lasted 6 episodes, though 10 were created. Above are the opening credits for the show, uploaded to YouTube by jpwrites. Full episodes are available on YouTube as well, but the uploader has disabled embedding. The pilot can be seen here: http://youtu.be/uQ9pERxgL6Y. Once again, Anne Baxter finds herself in a drama about what goes on behind the scenes in the theater. This early Merchant Ivory production is about the personalities and politics of the business and art of theater. The separate camps are the denizens of the "legitimate" uptown theater of Broadway and opera and the avant guard, downtown style of experimental theater that gained a foothold in the 1950's and by this the time of production in 1980 had become a force to reckon with on the New York scene. The warring factions are two former lovers - Lilliana Zorska (Baxter), an established acting teacher in the traditional style and Pierre (Robert Powell), a former pupil of hers and the Svengali of an experimental SoHo theater workshop. Caught in the fray are a young married couple - Ariadne (Young) and Victor (Kurt Johnson). He's gotten a role in a Broadway musical and she's become enmeshed in the touchy-feely world of Pierre's troupe. What sets off the fireworks is the right to produce a hitherto unknown play written by a 12 year old Jane Austen and the grant money to fund it. Though this film seeks to lay bare the process of creating two different styles of theater and the temperaments involved in each, it has a tendency to come off as a bit pretentious and at times tedious. There is truth, however, in the contentious nature of the warring camps. Art is such a subjective endeavor, that it can bring about self doubt, which, in turn can lead to deeply held convictions and personal attachment. Look for Sean Young in her first screen role. This film is available on DVD as part of the Merchant and Ivory Collection. Above is a clip, uploaded to YouTube by TheGreekoid. The clip features the first meeting of Ariadne and Pierre. Now that Halloween is over, I thought this film would be a fitting one to feature - not because it's scary, but because it's misnamed. 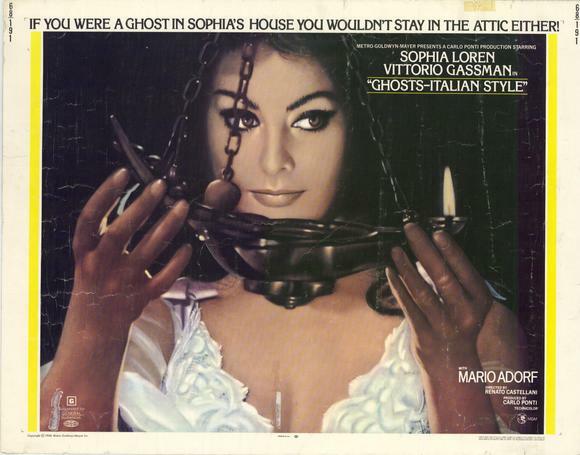 There's very little supernatural phenomena in this film, it's really a bedroom farce with Maria (Loren) being pursued by two men - her husband, Pasquale (Gassman) and a rich suitor (Mario Adorf) who wants her to get a divorce and marry him. The young couple, who are having financial problems, move into a villa that seems too good to be true - it's vast, with many rooms and classical detailing, but run down and it's rumored to be haunted. The only ghost haunting this house is Maria's suitor who sneaks around and is caught by Pasquale, who assumes he's the ghost. There are oh, so many misunderstandings and a good deal of Italian scenery chewing. Speaking of scenery, it's quite nice, both feminine and masculine - Loren is in beautiful form and both Gassman and Adorf are quite delectable. Margaret Lee plays Sayonara, a singer/prostitute who rents one of the rooms in the villa, and she is quite the character, wearing some pretty outlandish outfits. Look for an outrageous cameo by Italian film legend Marcello Mastroianni at the end of the film. This film has yet to make it to DVD. It can be found on television occasionally and the trailer is above, uploaded to YouTube by OurManInHavana.